The Missus loves the crowd funding concept. If you’ve had a vegan start up on Etsy, IndieGoGo or Kickstarter chances are she’s pledged some dinero to the cause. We’ve found some really good products this way, including one of last year’s gifts, a vegan Alfredo Sauce from Two Vegan Ladies. This year’s start up is Phoney Baloney from Tustin, CA. 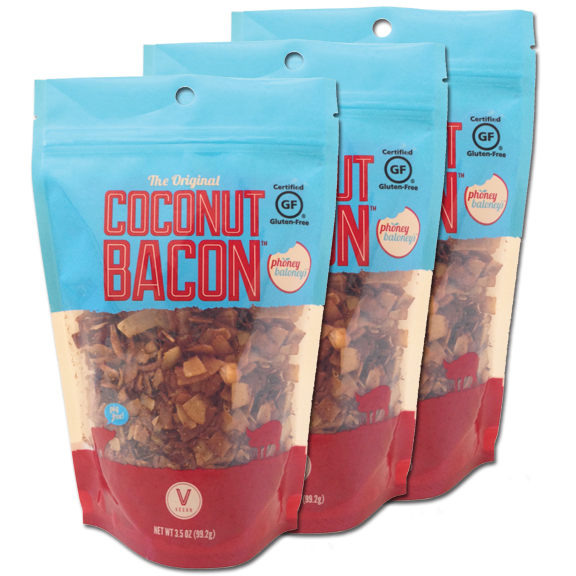 PB is the world’s first and only manufacturer of vegan, gluten free Coconut Bacon. Stef found PB on on IndieGoGo and what a find it was! When the initial shipment arrived we plowed through a bag within minutes. Even the little vegan who isn’t thrilled with most things coconut was hooked. Since then we’ve found many uses for including this Elvis Cake. Personally I love making BLTs with it. Today we a have bags of the Coconut Bacon plus a package of PB Rations, a tofu scramble seasoning mix. Phoney Baloney’s is awesome! I know a person can make coconut bacon from scratch, but they do it so perfectly, it’s hard not to choose them. Plus, it’s all conveniently packaged and ready to go. I love it on salads best of all. I’ve been dying to try this! It looks awesome! I love the new packaging! It’s just the designer in me I guess. I tried this stuff a while back and it really didn’t last long in my kitchen. I put this stuff on nearly everything I could think of! I just bought a bag from the co-op a couple days ago. Delish! Good to know it’s in stores…now I’m on the hunt! This looks so good. I hope to try it. I’ve heard great things about PB–never tried it. I’m tempted to buy some online. This company used to have a sandwich shop in Irvine, CA. It was on my list to head north to visit, however I did not make it and alas they had to close. The bacon has been on my “to get” list for a while now. I have been wanting to try this since I saw it online somewhere, or maybe it was in VegNews magazine. Oooooh I would love to try these. My sister will eat vegan when I cook but she’s a big ole carnivore. These would totally convince her to switch. Thanks. I’ve been wanting to try this forever! Just what I need for breakfast (and every meal)! I want to try this. I’ve heard about it, but I’ve never used it. Ohh, this looks great! I saw a recipe for Elvis Pie from Bittersweet and this would work really well for the bacon component. I have been dying to try this stuff, it looks incredible. You won a package of Phoney Baloney Coconut Bacon. Please email us your shipping address and we’ll get it out to you ASAP. Thanks for reading. Oh my goodness! I really want to try this! Thanks for the chance! What a great way to show my non vegan friends that Vegans have a sense of humor and are inventive!